I contributed to a panel on mathematical modeling panel at MSRI this week – five minutes of prepared remarks and then answers to a couple of questions. I mention those reviews not to marshal sympathy. I’m really happy with my remarks and I don’t think I was misunderstood! I’m mentioning them to acknowledge that my remarks caused a lot of anxiety among people who call themselves mathematical modelers. I’ll respond to some of those anxieties below. Hey folks, I’m Dan Meyer. I work at Desmos where my team makes modeling activities using digital technology. I’m an optimist so I’m hopeful for modeling’s future even though I feel like it’s in a diminished state right now. On the one hand, you have the folks who are defining modeling down, folks who will call any problem modeling for the sake of a good alignment score for their textbook. On the other hand, you have organizations like the ones that authored the GAIMME report who are defining modeling up, who are placing modeling on a mountain that is far too high for any mortal teacher to climb. First, the report is 200 pages long, which is a lot of pages. I’m trying to think back to my time in the classroom, wondering during which interval of time I’d read a report of that length. Weekends? Gotta finish up True Detective Season 3. Summer if I was on a grant-funded project led by university professors like yourself? Now we’re getting somewhere. But beyond the length of the report, it depends heavily on adjectives like “messy,” “open,” “real-world,” and “genuine,” adjectives which have no shared meaning. None. 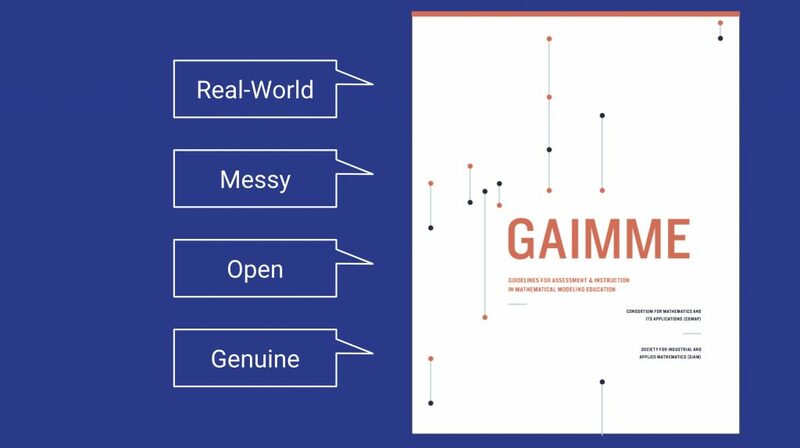 The only way to know you’re doing modeling is to ask the authors of the GAIMME report if they think what you’re doing is messy, open, real-world, or genuine enough. I want to challenge that narrow definition of modeling. 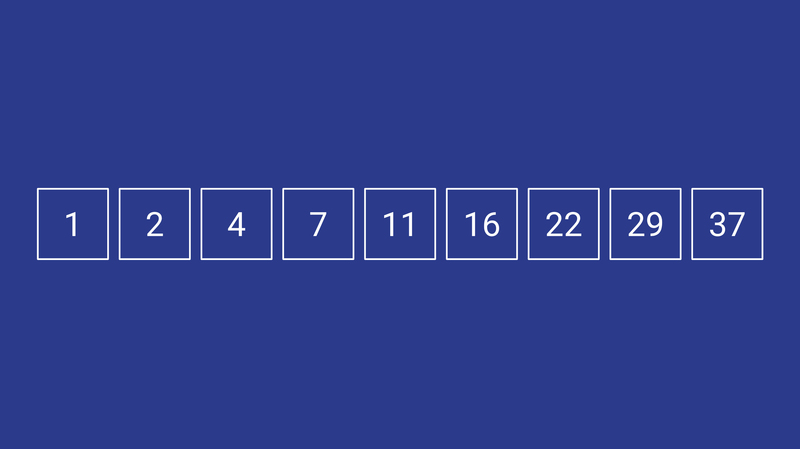 The first number in a sequence is 1. What might the next number be? Maybe 2? Maybe you’re thinking about counting or cardinality. It’s 2. What might be next? Maybe you’re thinking still about counting. Maybe you’re thinking about powers of two. It happens to be 4. What might be next? It happens to be 7. What might be next? That’s right. That’s the sequence. A statement I suspect very few people in this room will agree with is that was mathematical modeling. 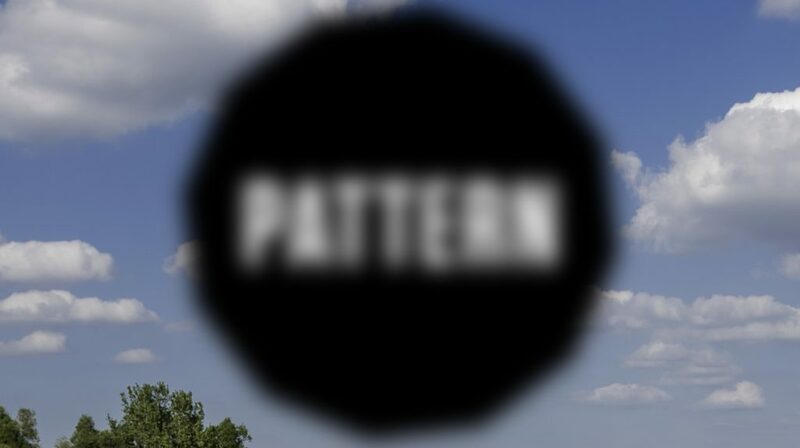 You took your early knowledge of the pattern. You put it to work for you. You found out something new. You revised your model. It came into sharper focus. Suddenly you did know the sequence. Several pleasure centers in your brain lit up simultaneously. That is modeling. It’s the same with learning anything – from short, abstract sequences of numbers to huge, abstract concepts like love, which you think you understand as a kid. It’s defined by your relationship to your parent or guardian. That’s what love is. Or love is everything but that. 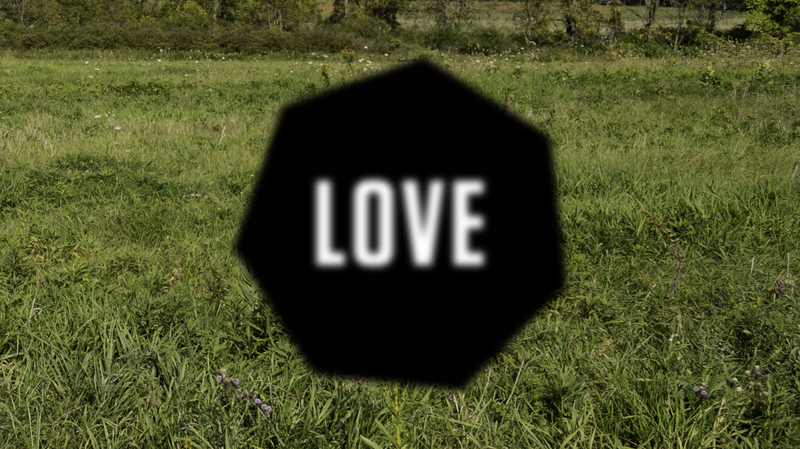 You go out and put your understanding of love to work for you as a young adult. You find out something new that reveals the limits of your ideas of love. You revise and sharpen your ideas. You put those ideas out into the world until you have that first traumatic break-up and you realize your model for love is even fuzzier than it was originally! All these experiences help you revise your model for love – never completely, never correctly, never incorrectly, and always in process. We think it’s like this, that modeling is a subset of math learning. And that our goal is to make the subset as large as possible. But to name that distinction is to undermine the goal. We cannot tell teachers that some days are modeling days and some days are not modeling days. That on some days, you should draw on students’ funds of knowledge and on other days you can ignore them. That on some days, you should elicit early student ideas about math and on other days you can transfer mature ideas from your head to theirs. That on some days, you should provoke students to refine their ideas about math and on other days you can treat their ideas as though they’re finished and ready for grading. That’s too confused to work. I think this is actually true, though it isn’t the entirety of what I’m trying to say. 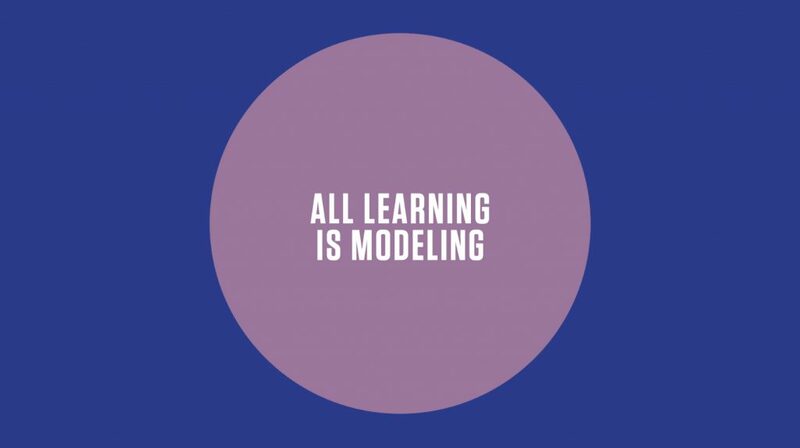 What I’m saying is this: that all learning is modeling. It’s true about love. It’s true about a sequence of numbers. It’s true about modeling itself. You came in here with a model in your head about modeling. You’ll test that model here at MSRI. Everything you hear and see and experience will change and strengthen your model for modeling. We will all walk away with a different model for modeling than when we got here. So let’s not trivialize modeling by defining it downwards. Let’s not define it upwards, out of reach of anyone outside of the academy. Here are a few follow-up thoughts, mostly addressed to the people at #CIME2019 who felt strongly that “mathematical modeling” and “learning” are fundamentally different processes. So we might as well start this fight now. I think Dan is completely wrong. The reason we wrote the GAIMME report was to put out a standard defintion of modeling. Now you could use another definition. But the definition of mathematical modeling in the report and the one all the people I know who work in the field agree on is that it begins with a real-world problem. [..] Most people would agree or at least – it’s not a question of “agree” – it’s a definition. As some math teacher of mine once said, defintions are neither right nor wrong, they’re either useful or useless. If your definition of “real world” labels the US tax code as real and polygons as non-real, your definition is not useful. To most US K-12 students, the US tax code is very non-real and polygons are very real. If you define “real-world” as a property that is binary rather than continuous, that is fixed across all cultures and time rather than relative and mutable, if your definition doesn’t account for the ways (per Freudenthal) that contexts become real in someone’s mind, it isn’t useful. And if your distinction between “mathematical modeling” and “learning” depends on “real world,” a descriptor without a definition, it isn’t a meaningful distinction. That lack of definitional precision will undermine broad adoption and cost teachers and students dearly, as I’ll describe next. Teachers need fewer ideas about teaching. What is gained and what is lost by lumping all learning under the umbrella term of “modeling”? What’s gained is coherence. What’s gained is the opportunity to take all these pedagogical toolboxes teachers currently have on their shelves – toolboxes for “real world” and “non-real world,” toolboxes for “mathematical modeling” and “not mathematical modeling” – and replace them with one toolbox: modeling. Modelers: teachers still need you. But that isn’t what I said and it isn’t what I believe. Serious work is necessary here and people who understand modeling are well poised to lead it. To help students learn anything, teachers need to initiate the modeling process, eliciting early ideas, provoking students to determine their limits, and helping students develop their ideas further. All learning is modeling. But not all teaching initiates the modeling process. People who call themselves mathematical modelers understand that process better than most. We just need them to drop this meaningless distinction between the real and non-real world and apply their skills across all of teaching. My proposal here makes modelers more necessary, not less. There are so many points I’d love to jump into the middle of but I’ll stick to one: what is mathematical modeling? I think the two biggest issues are how do we define it and how do we communicate that definition in a practical manner? I agree that the GAIMME report chose to be thorough over practical, but I think you went to the other end with “all learning is modeling.” Personally, I prefer something more in the middle. I’m currently using a Spies and Analysts structure (https://robertkaplinsky.com/mathematical-modeling-need-better-spies-analysts/). The spy component is where the modeler collects all the known information and acquires any unknown information. The analyst component is where that information is processed and turned into something actionable. And this process continues until the actionable model is useful. My concern about your definition of lumping everything into modeling is that it may make it harder for people to know what isn’t mathematical modeling. I’m with Robert here in that I think it is very easy to read Dan’s explanation here and conclude that when he says “all learning is modeling” that he means that all *teaching* is modeling. 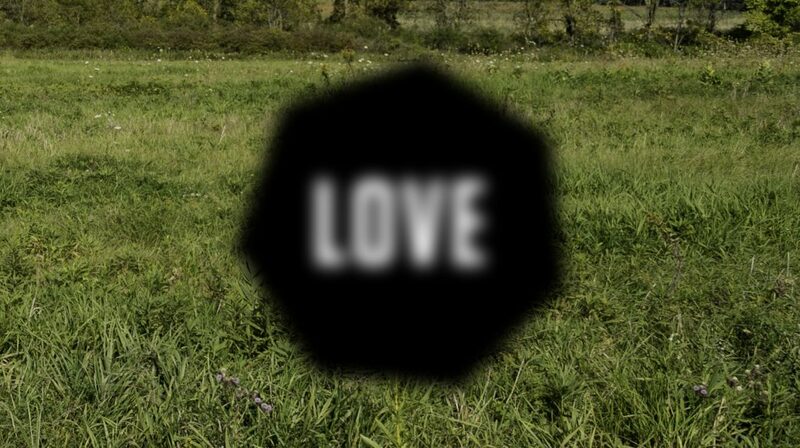 The distinction isn’t (yet) clear enough for me, unless I look very closely. I’m with Dan here when he says that the distinction between real-world and not real-world is meaningless–and in most cases patently ridiculous, as highlighted repeatedly on this very blog! The thing that emerges for me in conversations about the modeling process is all of the Design Thinking work that has been done. It all sounds, to my untrained ear at least, to be the same principle. Is there a way to incorporate/disseminate that body of knowledge to math teachers in ways that could be effective? Maybe hitting somewhere between Dan’s 5 minute talk and the 200 pages of the GAIMME report? Sounds like there’s something needed to fill that gap. I’ve generally been a fan (and still am) of “real-world problems”, but in this context I would agree with Dan. I think the disagreement over what “modeling” is is somewhat academic, in the worst sense of that word. I think Dan’s emphasis on “learning” is where most of my thinking is at this point. The GAIMME report (which I’ve now downloaded, but haven’t read yet) is 200+ pages. To Dan’s point, no teacher at the school I just retired from will ever read that. As I’ve probably commented here before, very few of those teachers will even read this blog (or participate in any way, shape or form in MTBoS), much less the GAIMME report. I think this is where the “academy” diverges from my “real-world”. If a report falls in a forest and no one reads it, does it make an impact? (tortured, I know). 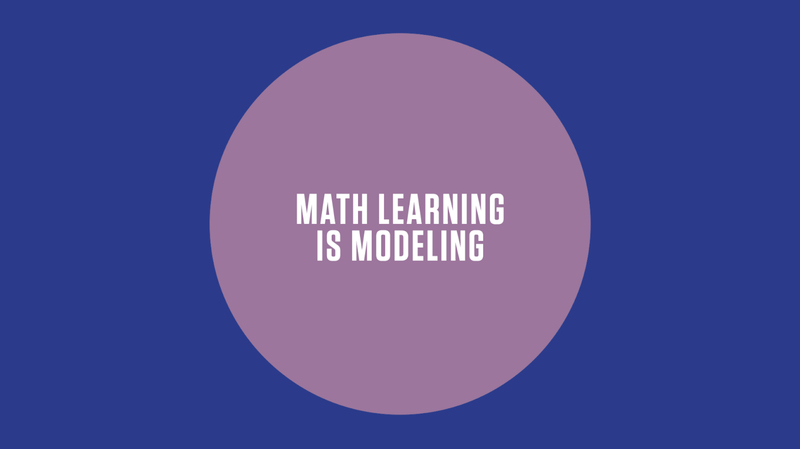 If the folks who believe in a more “strict” definition of “modeling” care about the learning that students are actually doing, and the teaching that is happening that is hopefully helping that learning, they need to step away from the “definition of mathematical modeling in the report and the one all the people I know who work in the field agree on”. The “field” where this game is being played is a very different one than the one they are talking about, and the teacher-players and the student-players are the ones that matter. What if we had two words for this? Dan you describe and illustrate perhaps a subconscious-heavy view of learning as updating, iterating, discussing prior conceptions… in other words, each person’s mind has a model of all of its inputs and we continuously update them because that’s what humans do. Do proponents of “non-Dan” modeling mean a more conscious effort? Does it perhaps imply that the learner is choosing to bring some idea to bear on their current problem? Perhaps they imagine the learner has a library of ideas behind them and a problem in front of them: the learner can then choose to bring one of their library ideas to bear to see if it makes any headway on their problem. The learner follows the rules of their previous idea, perhaps dutifully noting how the previous idea does or does not fit the current situation. Then, the learner may conclude that the idea is or is not a good fit, and choose a separate idea to try. Without trying to put words in the mouths of these sides, is there room for an acknowledgement that students (all people) aren’t quite aware of their personal library of ideas behind them? Dan’s argument seems to be that this library not only is constantly updated, but that there is no way to perceive the world without the lens of one or more of your ideas being employed, and therefore updated. But the others perhaps argue that we should attempt to be aware, organized, and selective of the ideas we employ. In that sense, while I agree with your description of learning, there is more to say about a specific conscious action of modeling that layers on top of that. On the flipside, the conscious efforts must also be aware of the subconscious always-on modeling we all do. If we began with two different words, would there still be a fight? Without trying to put words in the mouths of these sides, is there room for an acknowledgement that students (all people) aren’t quite aware of their personal library of ideas behind them? FWIW, part of teaching modeling as I’m formulating it here is “helping learners understand explicitly how their mental models have changed throughout the lesson / modeling cycle.” I don’t know that we differ there. Applying the thinking skills one might use in that example to other learning situations is certainly valuable. Would a teacher jump into such a lesson without doing lots of other thinking skills that are used in “modeling” as defined in GAIMME or elsewhere? Probably not. But this reminds me of the “retire #MTBOS” discussion. Does “Mathematical Modeling” label alienate or scare people away from doing mathematical modeling, which can come in many forms? Maybe, but we’re not likely going to retire it or redefine it. On any day, we can use multiple elements of the well-established modeling process and keep inviting students into new mathematics, “real world” or not. 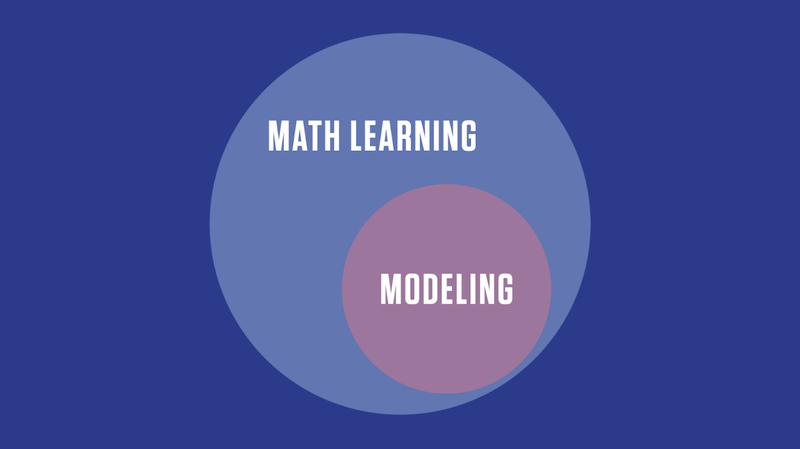 I see learning, math learning, “modeling” as intertwined, inseparable, and not quite captured by the Venn diagrams. Every day can be a modeling day, but not every modeling day is the same as every other. We need not let the definition exclude; let it helps us see where we are and where we might go. A few years back had a conversation with a PhD in Cognitive Science @ OISE (Ontario Institute for Studies in Education) who said the emerging consensus in CogSci is that conceptual understanding lies in the multiplicity of representations. In math we call it modeling. Making connections between the models (representations) is the essential thing for teachers to learn. For those jurisdictions who start patterning & algebra in JK – we start with modeling patterns concretely, then pictorially, then abstractly (for a pattern that goes red green red green – calling it an AB pattern is more abstract than calling it a RG pattern – because it is more generalized – like algebra). Then growing patterns where we continue to represent concretely, pictorially, with words (while in parallel developing the concept of equality) then with tables of values at about 8 years old. Then graphically and finally with expressions and equations about Grade 6/7+. Sticking to linear functions (patterns) at first and then quadratic in secondary. It is all of these representations/models of a pattern that create a deep understanding of algebra. Along the way, it is the teacher’s role to help students make the connections between their various models. Teachers need big ideas and principles that they can then apply to their classroom setting. As Dan says, classroom teachers are not going to read 200 page theoretical work. When someone goes into a classroom and says what does this look like at various levels of the school system – then you have my attention. If I could summarize your point a little differently, it seems to me that you are actually focusing on the mystification and reification of mathematical modeling by the high priests of math education. On your view, that mystification and the priestly class who mediate access and approval are robbing both classroom teachers and students on the ground of both their innate rights to both agency and authority for defining and driving the work of teaching and learning about modeling. What is more, if I understood you correctly, you were/are then arguing for the emancipation of both classroom teachers and students from these narrow priestly definitions and restrictions on how we classroom types approach both the processes of mathematical modeling as well as the very ownership of the concept of modeling. And boy, howdy, what struck me in the follow-up exchanges was the power of the backlash to your peeling back the curtain and exposing the structures of authority that are restricting access to the power of modeling itself. I don’t have a lot more to say right now about the actual nuts and bolts of the modeling process because I need to chew on this more. But holy crap, I am really astonished by the reaction of this audience to the shifting of the tectonic plates that you proposed. I guess I’m wondering about the use of your definition. If the report is limited use because teachers won’t read it, your ‘all learning is modeling’ risks teachers using it to excuse that what they’re doing is modeling. Do you see value in learners’ modeling as Garfunkel et al are defining it? What are the conditions that makes it more valuable? What does it say about what we need to do with the other part of our learning time, or about our curricula? The only difference Garfunkel highlighted between our two approaches was that my number sequence wasn’t “real world.” Like I said in this post, that distinction isn’t meaningful to me. But I do think we should elicit lots of student ideas – ideas about a sequence of numbers and ideas about feral cats breeding, for example. Lots of different contexts. And we should help students learn math through those contexts using pedagogies that are consistent. I agree with much of What Dan presented here but disagree with the assertion that all learning is modelling. Some might contend that all *meaningful* learning is modelling but there are facets of learning that are not modelling. The easiest example I can think of in mathematics is memorisation of facts such as formulae and multiplication tables. This is undoubtedly “learning” but it would be a stretch to call it “modelling”. Using Bloom’s taxonomy (cognitive domain) then “modelling” is not applicable to the knowledge level but is applicable to all levels above knowledge. That said, I agree with Dan’s broader point, which is that modelling is used as a framework for learning and understanding across all domains. Our science teaching colleagues are way ahead of us in using this idea. Much of what is now taught within science (at least here in Australia) is taught through the framework of models. Models are explicitly taught and discussed as useful (but imperfect) ways to understand and make predictions. Multiple models for the same phenomena happily coexist as they are useful for different purposes. Mathematical tools form part of these models but there are many other important elements to the models. I think it’s worth being careful with our language; “modelling” and “mathematical modelling” are not the same thing. The panel was convened to discuss “mathematical modelling” and Dan presented on “modelling” without really acknowledging the switch. Much intellectual meat for me to chew on – thanks for the post. The easiest example I can think of in mathematics is memorisation of facts such as formulae and multiplication tables. This is undoubtedly “learning” but it would be a stretch to call it “modelling”. Using Bloom’s taxonomy (cognitive domain) then “modelling” is not applicable to the knowledge level but is applicable to all levels above knowledge. I don’t know. You had early ideas about numbers, products, and tables. Those ideas were provoked – even if through memorization. You determined the limits of your early ideas and developed new ideas. The degree to which your teacher initiated the stages in that process has a lot to do with how well you learned your multiplication tables, but it’s still the same process. This is a great post, and I’m glad you’re bringing in the perspective of a classroom teacher to the world of academia. One quick little thing you said that really resounded with me, during the number sequence model, was “not everyone’s talking, I get that.” I guess I chose to infer a deeper meaning to that. I love me a good chance to put words in someone else’s mouth, so maybe if we really want to make progress it is dangerous to advocate any kind of shared vision (as Garfunkel seemed to do right off the bat) until we’ve first taken time to encourage multiple perspectives and voices. And especially those that challenge any kind of status quo, as those are the voices that tend to get marginalized. Dan’s questions result in thoughtful answers. I hope mine is. It comes from an effort to understand what understanding math might be in school learning. Three assertions: (1) modeling in/with/by math is not understanding math, (2) modeling uses math to analyse data, not so much to understand it, (3), a useful mathematics is disconnected from the “real world”, it is abstract. Discussion of the discus trajectory takes us back to the point, arguably the earliest, when humankind learned how understanding was separate from, but based on, a modeling of data. Kepler modeled planetary orbits/trajectories. Newton understood the “the trajectory of a falling apple at the earth’s surface was the response to to the same force responsible for the moon’s orbit. From Newton we have been on apath to understanding. We see the same math we reasoned out works at the smallest and largest scales, it was abstracted from its original inspirations. Trajectory modeling (keplerian) of down curving trajectory data, height vs distance. It’s not straight, let’s put in the least curvature possible and fit 3 parameters to a + d + cd^2. We have a, b, c along with some fitting parameters. How does a Kepler get the function of time shown?. No data, Kepler had to look at planet data, the planet images moved slowly enough to time and point at. Newton had to understand it worked both on planets and the earth’s surface. 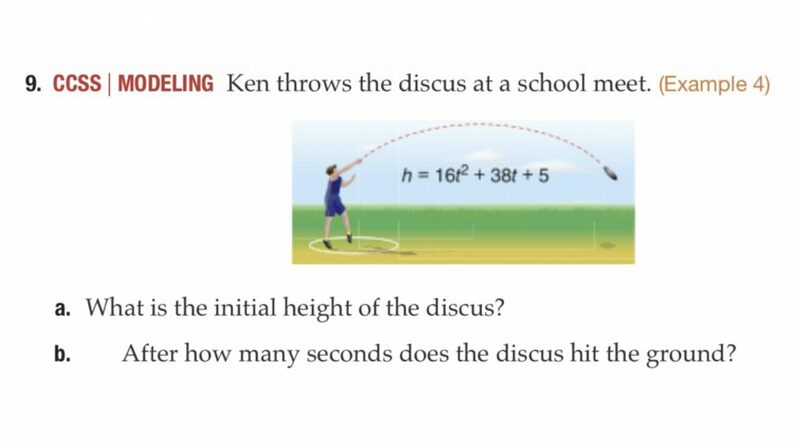 Newtonian understanding: discus doesn’t go farleads to flat earth idealization. Heavy discus, air doesn’t drag it or lift it, much. We idealize: no force in the horizontal direction, hence horizontal velocity on trajectory is constant, vHz, and d = vHz x t. I leave the rest for you. Note there is a disabling typo, the acceleration term must be negative, gravity is pulling the trajectory down. Dan’s modeling probably subsumes understanding. Mine is more like modeling is what you do when you don’t understand, which is often, and hence it can be useful. It can also be deceiving though. How many high school students still believe subtraction is removal, a pizza wedge is a fraction, a negative charge is a negative number, down is negative, up is positive? Negative is special, positive is natural? There is a heavy philosophy question here, Google “steven weinberg Whig”. It’s the question: does history inevitably oscillate back and forth between blurry and bright? It may be that Dan and I have significant worldview and educationview intersections in our philosophical sets, but I don’t often find myself in disagreement with what I read here, and this is no exception. There are certainly some semantic arguments that can and are being made here, about the words modeling and real-world, and authentic, but I think that speaks to Dan’s argument that there in fact are no agreements on the terms we use in math education. The description of all learning (not teaching) as modeling really resonates with me. My background is varied—I’ve spent time in biochemistry, science writing, environmental engineering, playwrighting, and acting before landing in a math classroom, and often spend time thinking about a holistic view of content that drives my colleagues nuts. And in doing so, I see mathematical processes and modeling everywhere. As a playwright, I start with the seed of an idea, and experiment to see if I can find some kind o emerging pattern or understanding or deeper truth in the story that emerges. I reflect upon, and call in other points of view, and discuss, and revise that developing representation of the world until it can exist on the stage—at which point the audience can use it to create their own understanding. I don’t see this process as dissimilar from creating models in mathematics for a more utilitarian purpose, although until today I probably wouldn’t have categorized it as such. Trying to decide what constitutes ‘real’ modeling and what does not strikes me as akin to exclusionary tactics in groups that are unwilling to accept challenges to their own thoughts. What we should be after as educators is good thinking, and finding ways to include our students and colleagues in developing that. I think talking about modeling as a broader and more accessible idea makes it easier, not harder to do. The controlled face-palm around the 59 minute mark concisely captures my thoughts. There are walls built around what academia believes a high school student’s real world is, and eroding those walls is the next big step for us to make. Enjoyed that conference session. Thank you for sharing! Exploring what questions arise when staring at something in nature or while playing a video game. How can this grocery store trip become more meaningful and preparatory for one day living on your own? Sometimes we solve set puzzles, logic problems, and old fashioned word problems (we call them mysteries to solve)…other times we use ordinary mundane activities to explore and other times we go down rabbit holes with a subject that elicits passion, curiosity or challenge what we thought we knew before as a vehicle to picking up math skills, practical skills, history, writing and language skills. This is the kind of learning/modeling view I think you Dan, are suggesting as a more inclusive way to define modeling…perhaps, suggesting, that if we teach with worksheets all day every day then that is really hammering home/modeling a certain way to learn…and that that worksheet example, as any type of modeling can have its uses and its limitations…did I grasp that the way you meant it? Modeling goes beyond a 60 minute hands on exploration as defined in a curriculum and reaches out into the daily observations and questions we are asking and how we choose to set about solving them all the time. Modeling is what the students are picking up on whether planned or not, often making connections on many intended and unintended subjects at the same time. I am challenged by this daily since this more expansive idea of conscious modeling in most schools I attended was not how I was taught. As I see it, Math is another language, a silent one, describing the world as we see it, a language of notations of time, space, and matter. It is not unlike any other language in that it’s purpose came about as a way to communicate/share, categorize/organize, compare/contrast. Then, maybe, science is the mythology the storytelling of a world often using math to describe observations, examinations, experimentations, assumptions, and conjecture ….the stories we form before, during and after encountering and experimenting. Music could be the intersection where math, sound, self expression, and that intangible/mysterious life force of inspiration merge. Spoken language as an offshoot of music. Written prose, fiction and non-fiction, is the analogue to science while poetry can represent lyrical math, the musical mathematical notations creating a concise melodic equation. My first reaction is that this is a disagreement of the meaning of words and hijacking the term “mathematical modeling” to be “modeling” which you then equate to just “learning” is confusing. On the positive side, I like how you describe the concept you refer to as modeling. I think they’re is a point that is like to hear you expand on about who should be in charge of the vocabulary that describes what teachers do. Some where in the exchange it’s conceded that modeling needs to be defined by people at events like MSRI, which is what your detractors are saying. An alternative might be that modeling should be defined and articulated by the people in the field who are teaching it, not the theorist who study it at a high level. I’ll argue that the people in the field should be the ones who own the vocabulary, and they should come to events that should exist, armed with binders of student work where they settle what all these murky terms mean, and clarify the distinctions along the curriculum. Since the event that would produce your definition doesn’t exist, your stuck at MSRI defying the academics on the academics home turf. I don’t know if I agree with you entirely, but I do think separating pedagogy into unclear buzz words makes the teaching confusing. what do you mean by “own the vocabulary”? I don’t have this impression of the report. Are organizations “placing modeling on a mountain that is far too high for any mortal teacher to climb” – not my impression either. I have been glad to have people who work on “grant-funded projects led by university professors” and who engage with teachers K-12 all along the way. K-12 teachers and people in organizations and universities can and do come together for the benefit of students, and should continue to do so. What you say rings true to my experience as a modeler/mathematician/teacher/human! That said, my thoughts ebb and flow like a pendulum between thinking that all math is modeling and the idea that math–in its purest form–can be abstracted into a “non-real world” universe. I think the beauty of mathematics is that it can be both! I also think that even in that austere universe of abstraction that the act of stumbling around searching for the light switch is still “modeling”–or at least akin to it. I see now difference between searching for a mathematical tool to solve a “real world” problem like describing the current of a circuit and trying to develop a mathematical tool to solve a “non-real world” problem like what can the angles measures of a cyclical polygon be. Both are searching to make meaning out of our human experience. Thanks again for the excellent, soul searching, read. Dan, in one of the first posts of yours that I ever read, you publicly shared the story of a panel interview in which you said something controversial that upset the academics in the room. Your posting of that experience, of course, invited more backlash. You earned my respect for being willing to put it all out there. Though I sided with the professors in that instance, the question you posed was interesting and relevant, and the conversation was worthwhile. Seven years later, I am glad to see that you haven’t lost your provocative touch, nor your willingness to place yourself in the crossfire. 1) My thoughts align with Bree’s… I think the answer to what modeling lies somewhere in the middle of the extremes posed here. 2) I understand the concern of some about the danger of giving some teachers an excuse to keep doing what they have always done. The good news is that those teachers are not reading blogs so I think that point is fortunately mute. 3) My biggest concern is that neither a 200-page report nor Dan’s characterization of modeling will help students understand mathematical modeling (though I think many of his lesson activities do). What is most relevant for both teachers and students is how the new standards define Modeling with mathematics (http://www.corestandards.org/Math/Practice/). For example, if we take just the first line “Mathematically proficient students can apply the mathematics they know to solve problems arising in everyday life, society, and the workplace” we can say yes, everyday life for adults involves more tax code than polygons, but for students it is more about the polygons, so we should agree to have them experience both in the classroom. But still… we have to find a way to communicate modeling to students in way that is accessible to children from kindergarten through high school. I’ve ruminated on this for a while, but I don’t know if that will make my response any more coherent. There’s a lot to unpack in this conflict. There is a difference between modeling and getting the answer. You suggest that people need to employ modeling to predict the next term in your sequence above. But you yourself have pointed out previously that theres a big difference between identifying the next term in a sequence, and the next millionth term in a sequence. They require different levels of abstraction, and modeling is what ties those different levels together. My students (and I have taught across the full spectrum of sill levels and abilities) always want to stop as soon as they have “the answer”. Modeling involves more than that. In fact, a big part of modeling is “what new questions does this model raise”, and that’s something that was left out of your fairly simple example. This is one of the many online discussions which simultaneously fascinates me and also intimidates me to jump in. I am less concerned with the working definition with modeling, though I agree with the premise that modeling can take place sans context and more concerned with underlying classroom cultures for exploring modeling. Your number sequence problem is a wonderful example of this, and I wonder how different teachers might each approach this problem in their classes. How are ideas shared? How are conjectures shared? Who is doing the talking? How does the debate resolve itself? When and where does it connect to formal understandings? Rather than a detailed GAISEE report (which I admit I have just “browsed”) I would rather learn small moves from experienced teachers all leading classroom discussion with this powerful prompt. I would have to agree with Bob Lochel that jumping into this conversation is a little intimidating but here it goes. I think Dan has and continues to challenge the status quo with regards to what mathematical teaching looks like and this commentary on modelling is no different. If I can simplify what I think Dan is getting at here is that the ideal of modelling is an important part of all learning and if we are overly definitive in what it has to be many teachers will just opt out of doing it. Dan Peter gives some good examples in his post of how that modelling and representation of mathematics develops from K into later grades. I’ll admit that I’m not familiar with the definition of modelling as defined within the GAIME report but outside of the “real-world” (as Dan has routinely pointed out, when it comes to learning the real world can be overrated) reference the others (messy, genuine, and open) seem to really just describe learning. There are a couple of misunderstandings of the GAIMME Report flowing through this interesting and thoughtful discussion that I think it might be helpful to address. I served as the lead author of the high school section of the GAIMME Report. Because mathematical modeling is difficult to define, we wanted to illustrate our (the writers’) definition with examples; for us, mathematical modeling is thinking about and working on “problems like these”. The tasks themselves are exactly as Carl Oliver requests. We came to the writing task “… armed with binders of student work…”. That’s what the examples are: student work. We tried to make it clear to the reader what we mean when we say “mathematical modeling in the high school”. No one is required to agree with this definition. Our definition is not Dan’s. All that means is when we say mathematical modeling to each other, we aren’t talking about the same thing. If we failed in this effort, well, then we failed, and that is unfortunate. But GAIMME was not written by the “high priests of math education”, or someone from academia with no daily classroom experience in the past ten years trying to impose a definition on everyone. It was written by classroom teachers working everyday with students from Algebra to post Calculus. The examples in the GAIMME Report are compilations of the work that my and my colleagues’ students have done over the past 30+ years working with students on mathematical modeling tasks. I am still trying to understand: (1) how does the conceptual understanding, more or less unique to math, come from leaning math by modeling? or (2) why is conceptual understanding unimportant? We can probably agree that most of us use modeling of some sort when we are stating to learn a new concept. The question is, do we stop there? Earlier in this thread Dan Peter provides a succinct description of the central role modeling plays in school math. This is how I understand him. Start at the lowest level. Model it, do exercises based on the model until you are comfortable with the model, move to the next level. 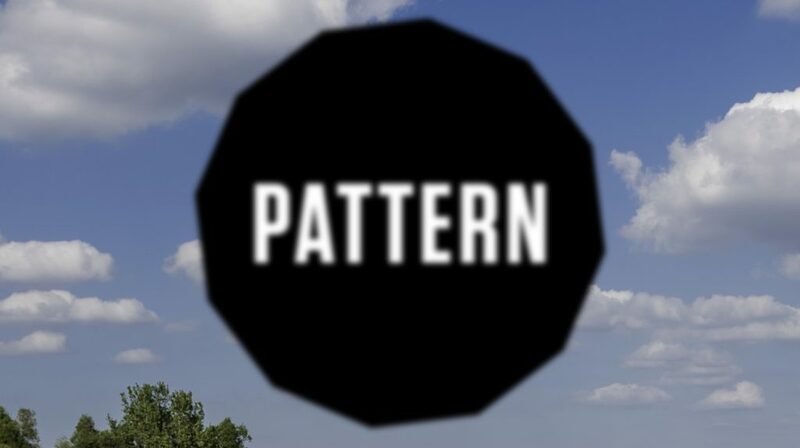 Iterate. It appears we do stop there, we never reach conceptual understanding. At any level our only understanding is based on modeling in previous levels. We never reach the point of doing math on its own terms. The math provided by modeling is never self contained, never abstract, always understood as relations to models of itself. It gets bigger, not stronger. It does not prepare students for the time when they need the strength of conceptual understanding. To me Dan’s presentation elucidates how I have been feeling about my math teaching and teaching overall ever since I became a modeling physics teacher. Hestenes described modeling as basically a loop of “development,” and “deployment.” After applying this pattern to my science classes over a few semesters I have had a hard time not seeing it in almost everything that involves learning–math, computer science, coaching sports, social emotional learning, raising my own kids, understanding myself. We’re not making our kids model. They’re already doing that. What we’re trying to do is create the space and opportunities for them to practice it effectively when they’re with us so that they can use it with purpose when they leave us. For what it’s worth I have found the words “modeling” and “mathematical model” more trouble than they are worth. What has helped me more is how RME (Realistic Maths Education) frames the idea of horizontal and vertical mathematizing. Horizontal mathematizing involves moving from the “lived world” into the world of mathematical symbols or vice versa. Vertical mathematizing involves moving “up” or “down” inside the world of mathematical symbols. An example (from Fosnot): A group of 8 kids are invited to a sleepover at a house with bunk beds. During the evening the 8 kids arrange themselves on the bunk bed– 8 on top, 8 on the bottom. This event is then represented using a RekenRek and in so doing it moved from the lived world into a symbolized world, hence an example of horizontal mathematizing. As the work progresses the thought of the bed fades in the learners mind with the rekenrek taking its place. Then numbers take the place of the rekenrek. 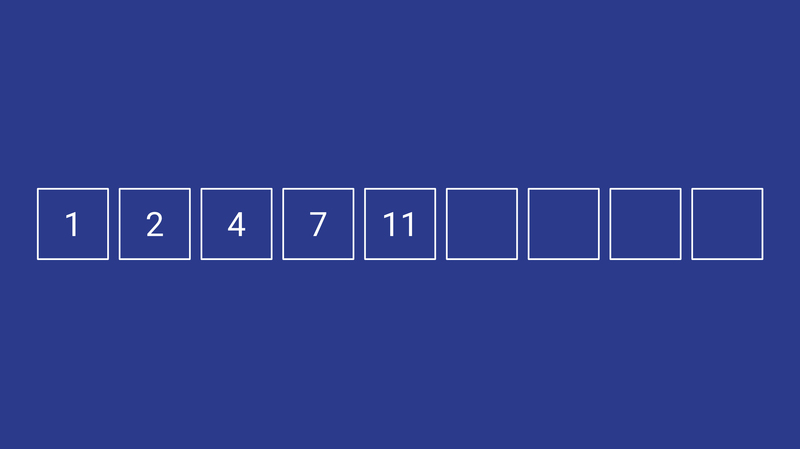 Rekenrek –> Numbers, a movement inside of the world of symbols, vertical mathematizing. I find getting my students to do this work– mathematizing horizontally and vertically– is helpful. 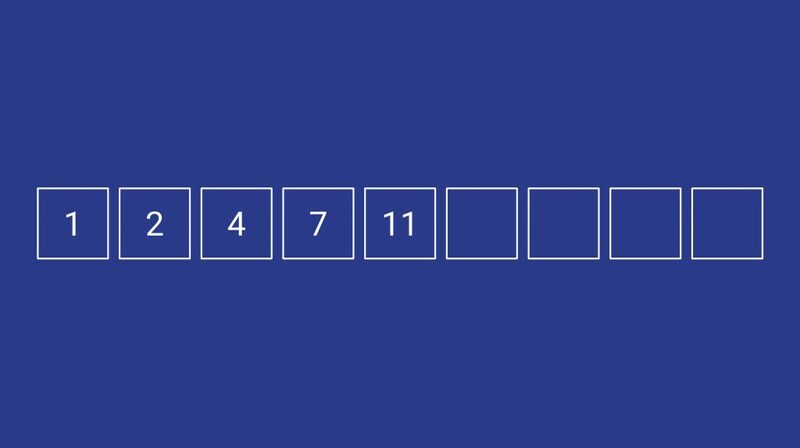 In terms of Dan’s problem of the 1,2, 4, 7, 11… sequence I would suggest that this is vertical mathematizing since it is strictly inside the world of symbols. To paraphrase a Japanese proverb, sometimes the shortest path between two points is around. I’m slow but I finally am coming around to see its wisdom. It seems likely reasonable definitions of “learning” and “modeling” exist to make it true. All school mathematics can be learned as modeling. I take school mathematics to be the mathematics students need to succeed academically and vocationally following k-12. I don’t think the following is true: All school mathematics can be learned as modeling. All learning is modeling, even learning in school mathematics. Any time a student has undergone conceptual change they have experienced the stages of modeling. But not all teaching initiates that modeling. Many teachers fail to elicit early student ideas, to provoke them in ways that lead to growth, to help them resolve those provocations and develop new ideas. I think Dan’s statement, “All learning is modeling” does float. All contexts are not created equal, perhaps. We could choose to use the world “modeling” for “the process whereby a learner tests out her early ideas, determines their limits, and develops those ideas further” but we could just as well call it something else. The teaching practice of “eliciting early ideas, provoking students to determine their limits, and helping students develop their ideas further” does deserves the most attention here. Developing such practices is perhaps THE most challenging mountain for teachers to climb for many reasons, but it is a worthy mountain. To “apply modeling pedagogy everywhere” (modeling as defined in something like the GAIMME report) is a very worthy goal, one that many have put effort into over preceding decades, under different labels, as noted by other commenters. “The kind of teaching and learning we are talking about recognizes the importance of the mental representations in the mind of each student, recognizes that these will be different for each student, and focuses on strong contact between the representations in the mind of the teacher, and those in the mind of the student. That does not mean that the main criterion is how well the student’s ideas conform to the official “correct” ideas; on the contrary, the focus is on how the student’s ideas are growing and developing” Davis, Robert B. (1997). Alternative learning environments. Journal of Mathematical Behavior, 16 (2), 87-93. Deserves much more attention. Continuing to discuss teaching so as to elevate the recognition of the complexity of the work is a Very Good Thing. When teachers express curiosity about diverse student thinking, students feel that and feel license to express even more diverse kinds of thinking. The more perspectives on an idea a teacher can help students connect, the more students learn about that idea. That all feels great so the teacher becomes more curious about student thinking and consequently re-evaluates her curriculum and instruction to emphasize tasks and pedagogy that are more likely to elicit diverse thinking. The teacher becomes interested in learning more mathematics because the more math you know, the more you’re able to identify and connect diverse student thinking when you see it. If I understand correctly, the universal activity of learning is modeling. A person who is learning, in an academic setting or not, is modeling. This is a fact of pedagogy independent of what is being learned. Teaching can bring value to learning by enhancing the process and experience of modeling. This is intended to be a paraphrase of Dan’s ideas. My only concern is school math retains the models used in the learning process as the meaning of the mathematics. It does not go back to show it is the limit of the modeling, not the modeling itself, that is mathematics. My point is not leaning how to make mathematics, it is the power I found in using it when I understood problem solving as the the deployment of abstractions. Before that I thought problem solving was retrieval of a model i encountered in school, and putting numbers into it. In a nutshell. Thank you. To have this as the benchmark will strengthen my lesson choices and prompts. Yes, your ideas are dangerous. But in a good way!